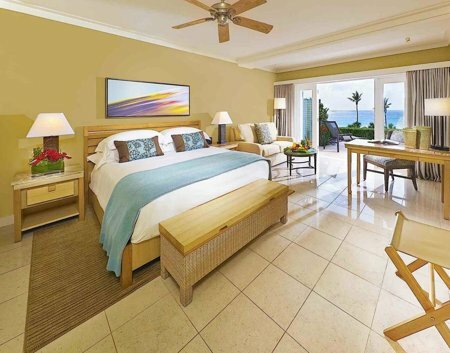 Elbow Beach Hotel is one of the Mandarin Oriental’s luxury hotels in Bermuda and one of the top rated accommodations in the island. The resort covers 50 acres of beautiful landscape and overlooks one of the most wonderful pink sandy beaches on the south shore. The beach is also known as the Elbow beach, a part of which is privately owned by the hotel. 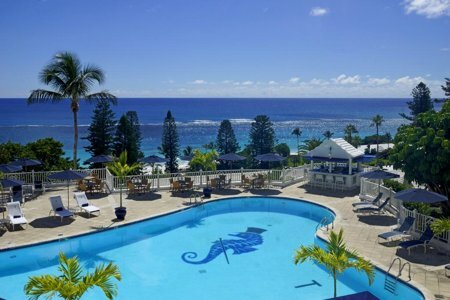 Elbow Beach Hotel is one of the oldest hotels in Bermuda. The main hotel building dates back to 1908. The hotel has however gone through many changes and upgrades since it establishment. The main hotel houses 131 guest rooms and another 104 cottage-suites and garden rooms. Renovations were done in summer of 2006, and everything looks much better now at this resort. The bedrooms, the full-service spa and fitness center, the tennis courts, and the swimming pool were all upgraded. The watersports program was expanded, the 24-hour room service and dining program vastly improved. You have a wide choice of rooms now - those with balconies overlooking the water, duplex cottages, and rooms with terrace overlooking the pool or the ocean. Update October 2014: Since April 1, Elbow beach is no longer part of Mandarin group and is now an independent hotel. The hotel has recently gone through some crisis. The occupancy rate had fallen, a part of the hotel was closed down and a new CEO has been hired to turn it around. The employees morale was sulking which has been now re-vitalized and the hotel is back on track. They have reverted to the old traditional Bermudian hospitality and all staffs are now Bermudian. They have also opened a service for personalized assistance. The lobby bar has been re-established. The hotel currently operates with 98 rooms. The management will soon add more meeting facilities as the focus will also be on group and corporate bookings which is to comprise of about 35% of the occupancy. Asian furnishings, hardwood floors, and exposed ceiling beams are the features of many of the rooms. The most spacious rooms are in low-rise buildings on terraces leading to the sands. Bathrooms are generally of Italian marble, with tub/shower combinations and touches of luxury such as robes. There are 98 accommodations including rooms, suites and cottages which can cater to virtually all type of choices. All have amenities such as ploh beds, separate shower and bath, coffee makers, large desks, both wire and wi-fi internet, LCD TV, audio system with iPod docking station etc. For honeymoon or a romantic stay, choose the one-bedroom cottage on the beach front with stunning views. It's not only designed elegantly with floor to ceiling French glass doors and looking like an exclusive villa, it enjoys a perfect privacy on the beach as well. This is the only cottage in the property which has a private access to the beach (it's known as Bird of Paradise Cottage). There are three restaurants at Elbow Beach Hotel offering a full range of cuisine, from casual to very elegant. 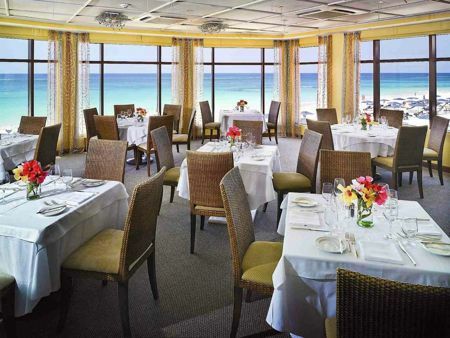 At the beachfront is the Cafe Lido restaurant with stunning views of the ocean and ideal for fine dining. They serve nice seafood and other items with a Mediterranean flavor. Another restaurant 'Sea Breeze' with al fresco dining on a terrace with wonderful view of the beach and the ocean serves Sushi, Tapas and drinks. The ambiance with wicker chairs, fire pits and bamboo trees all around is so relaxing. Great place to have a cocktail under the starry sky. 'Blue Point' is a poolside alfresco dining option serving lite bites like buffalo wings, salads, sandwiches, chocolate cakes and such. A full food and beverage service is available on the beach from Mickey’s Beach Bistro. 'The Deep Lounge' used to be a nightclub once. But now it can only be booked for private parties. The Spa at Elbow Beach Hotel has six private treatment suites, 4 for singles and 2 for couples . Each of them feature stunning ocean views, a hand-crafted granite soaking tub, bamboo flooring and pebble-lined steam shower. 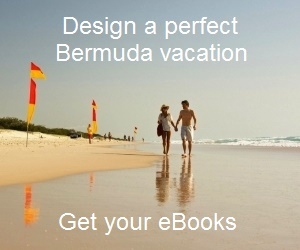 One of the best attractions of the hotel is the beach itself. Although a large part of the beach is open to public, the hotel has a half a mile stretch which is private and having lounge chairs, umbrellas, towels, changing rooms and showers, and of course it also runs the beach bar Mickey’s Beach Bistro which is accessible to public as well. Three restaurants and a lounge with bars; Outdoor temperature controlled pool; 5 tennis courts (3 lit for night play); a wonderful Health Spa with whirlpool & Sauna offering a range of massages, facials and treatments, a fitness room fully equipped with modern fitness equipment, internet stations with complimentary internet access, in-room wi-fi access, half a mile long private beach, scooter rentals from in-house operator Elbow Beach Cycles. There are five poolside cabanas to enjoy sunshine and relax. Spa services are also available here. Several activities are offered by the hotel including Private Yacht, golfing, horseback riding, cycling etc. The dive center Blue Water Divers has a concession stand on the beach and offers diving, snorkeling tours, kayak rentals etc. Update: Blue Water Divers have closed this hotel outlet. Recently a multi-million dollar upgrade has been completed at the Elbow Beach Hotel. The refurbished luxury resort now has 98 luxury cottage rooms and suites, each of which is named after flowers like Rose, Oleander etc. The rooms in the main building located on top of a hill have been discontinued. There are now in-room entertainment systems, luxurious furnishings, iPod docking stations, personal espresso machines and upgraded bathroom facilities. The Library has been enhanced to have a new recreation lounge serving complimentary refreshment; there is a newly renovated business center and gift shop; and an upgraded fitness room. The private beach now has new sun loungers and private cabanas. The new Spa Beach Pavilion provides ocean side spa therapies. The DEEP Lounge has been revamped with leather sofas, music and special atmospheric lighting. 60 South Road, Paget Parish. It’s 10 minutes taxi drive from the City of Hamilton. I am looking for the price of a taxi from the dockyard to elbow beach hotel. If you can suggest any other cheaper means to get to elbow beach resort. If I take the bus, how far of a walk is the resort? Thanks for your help. I truly do appreciate it. Hi, one way fare from dockyard to Elbow Beach hotel in a smaller taxi would be around $45. There is a bus stop just outside the hotel on South Road. The beach is however about 500 yards walk from the bus stop. The one word to describe the setting of this hill top resort would be: spectacular! The panoramic ocean view, the tropical breeze, and the pink sand beach will give you memories to last you for years. The dining was great and you have to try the beachside bar for a nightcap of a Jump Up and Kiss Me or Planters Punch. We have been to this resort twice and can only say we will be back again to Elbow Beach.